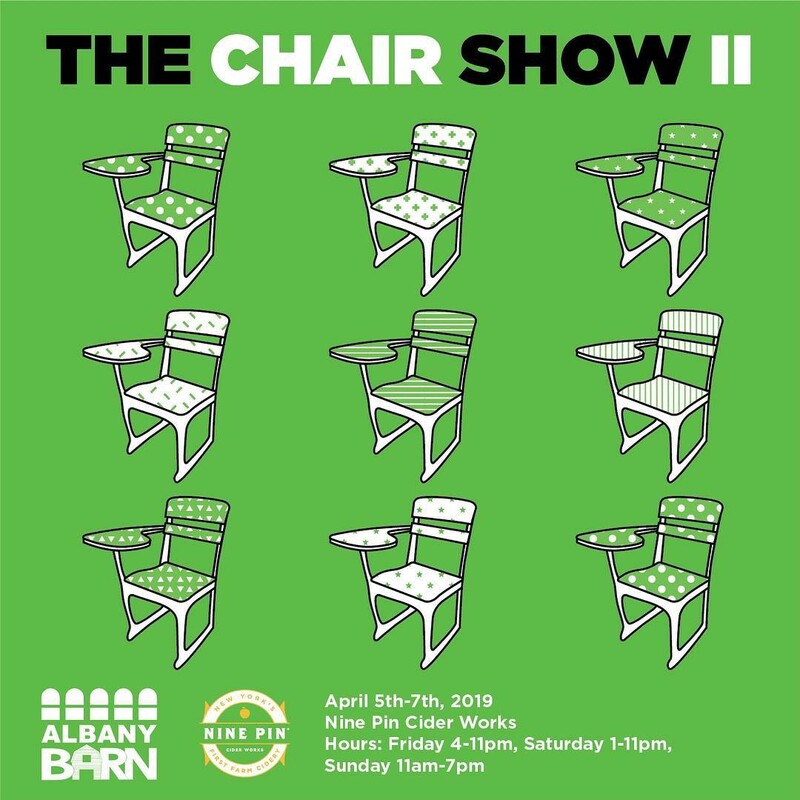 ALBANY, N.Y. (March 15, 2019) — Nine Pin Ciderworks (“Nine Pin”), New York’s first farm cidery, The Albany Barn, and Katherine Chwazik have announced upcoming art shows will take place at the cidery’s tasting room in April. House and Home will feature new work by Katherine Chwazik, in which it will be on display in the tasting room through May 26. The Chair Show II, a collaborative exhibition between the Albany Barn and local artist Tim Fealey, features 17 Capital Region-area artists and will be on display through April 7. “Just as cider is the elixir of conversation, art is the elixir of the soul. We’re thrilled to support and partner with The Albany Barn for these two exhibitions in our tasting room and we look forward to enhancing our partnership with the Barn in the future,” said Alejandro del Peral, co-founder and cider maker, Nine Pin Ciderworks. “When Tim Fealey came to us in 2017 with the idea for The Chair Show, we were so happy to finally give these desks a new lease on life, and to forge a new artistic partnership with Nine Pin Ciderworks. The exhibition was a lot of fun to put together, and we knew immediately it was an idea that we wanted to revisit again in the future with the hopes of growing and expanding. This time around, for The Chair Show II, we’ve doubled the amount of participating artists-we actually ran out of desks within the first two days of sharing the call for art! We’re really excited to see the designs our talented crop of artists come up with,” said Casey Polomaine, director of programming and residences, The Albany Barn. Both will open officially on Friday, April 5, with a reception from 6 p.m. to 8 p.m. In House and Home, Katherine Chwazik debuts her new work based in interviews with Albany County residents. She pulls from emotions and recollections shared to create artworks that capture a sense of place unique to each home. Chwazik layers printmaking and sculptural techniques to explore architectural forms that range from urban Albany neighborhoods like Arbor Hill to rural towns like Berne. The Chair Show II connects Albany Barn’s history with 17 contemporary area artists. Long before Albany Barn moved into 56 Second Street, the historic building was a school known as St. Joseph’s Academy. While most of the building looks different now, some of the old wooden school chairs remain, and they’ve landed in the hands of some of the area’s most talented artists for a special collaborative art exhibition culminating into The Chair Shows II. These 17 artists utilize paint, sculpture, wood etching, and even chewing gum to transform the chairs into unique works of art. For more information about Nine Pin Cider, please visit ninepincider.com. For more information about The Albany Barn, visit albanybarn.org.